Five-year warranty on selected Daihatsus | What Car? 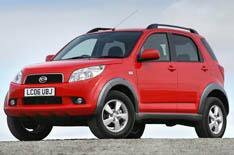 Daihatsus Terios 4x4 and Sirion supermini are now offered with a five-year, unlimited-mileage warranty. The new warranty package means buyers get an extra two years cover. Five years roadside recovery is also included. The rest of the range the Materia hatchback and Copen convertible continues with the old three-year, unlimited-mileage warranty. Company insiders say the longer warranty could be offered with these models, too, if the package proves popular with car buyers. Five years cover puts Daihatsu level with Hyundai, which offers such a warranty on all models. Only Kia, which has seven-year warranty on selected models, offers a longer new car warranty.